Santana Row is San Jose's vibrant shopping, dining and entertainment destination with trendy shops, restaurants, bars, spas and events. 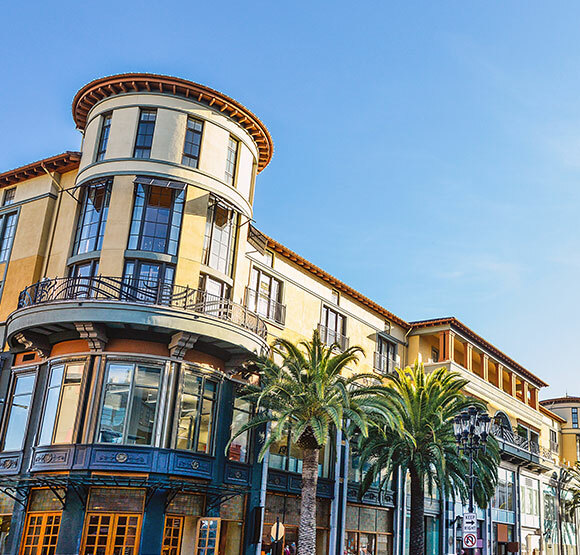 Stroll along Santana Row to an eclectic mix of eateries, from outdoor cafés to innovative restaurants and wine bars. Santana Row exudes a European attitude with it's fountains and architecture, and houses a French-style farmers' market and open space for concerts and events. Santana Row also offers fashion-forward stores, like Gucci, Diesel, Urban Outfitters, H&M, Sunglass Hut and Kate Spade New York. Enjoy exciting cultural events including the Santana Row Summer Music Series and the Makers Market. What are some top Santana Row restaurants? Enjoy all the foods and flavors of San Jose - from casual to gourmet - at the many trendy restaurants and bars on Santana Row. Elevate your culinary adventure at Santana Row restaurants including EMC Seafood & Raw Bar, Amber India, LB Steak, Left Bank Brasserie, Fogo De Chao, Ozumo, Consuelo's Mexican Bistro, El Jardin Tequila Bar & Restaurant and The Counter, where you can build your own burger. For some nightlife, check out Vintage Wine Bar, Yard House and Roots and Rye, featuring Wednesday's all night Happy Hour. What foods can I find at the Santana Row Farmers' Market? Le Marché Santana Row is an outdoor French market every Wednesday from 4pm - 8pm on Santana Row, between Olin Avenue and Olsen Drive. The streets turn into a colorful marketplace featuring over 50 area vendors selling organic vegetables, tree-ripened fruit, local cheeses, flowers, herbs, olives, gourmet cooked foods and mouthwatering rotisserie chicken. The farmer's market also features cooking demonstrations and tastings with local chefs.